Jumanji: Welcome To The Jungle – 4K Ultra HD Blu-ray review | What Hi-Fi? Is this 4K effort worth a trip to the jungles of Jumanji? If you're of a particular age, you may recall the original Jumanji film with fondness. Back in 1995, the idea of a board game coming to life was exciting – but less so in these days of virtual reality and CGI. So this belated sequel ditches those dusty board games for video games. Welcome To The Jungle sees four high school kids serving detention when they come across an old video game console. While playing the game, they are transported to Jumanji and given the quest of saving the realm. Failure to do so will risk being trapped inside the game… forever. Twenty-two years is a long time for a sequel, if you don't count 2005's sort-of-sequel Zathura. But with Dwayne Johnson, aka 'The Rock', leading the action, there's a fun time to had with Welcome To The Jungle. The forgettable opening doesn't initially inspire a great deal of confidence, but does at least flesh out the rather clichéd characters: the geek, the jock, the pretty girl and the anti-social loner. But once they arrive in Jumanji, the film starts to reel you in. Johnson, Kevin Hart, Jack Black and Karen Gillan play the in-game avatars of Alex Wolf’s Spencer, Ser’Darius Blain’s Fridge, Madison Iseman’s Bethany and Morgan Turner’s Martha respectively. Each avatar has a particular power and skill set that comes into play over the course of the film. From there, it becomes a standard story of four people with little in common, who come to resolve their differences. The potential for a sappy undercurrent is always present, but the film has a heartfelt quality that's hard to dismiss. There are few genuine laugh-out-loud moments, but the film does frequently tickle the funny bone. And the camaraderie between the actors means it's never boring when they’re on screen. There are times where the film gets its feet into a tangle and trips up. The mechanics of the game, regarding the fate of one character in particular, is illogical. The ending is so saccharine you may want to book an appointment with your dentist, and it also lacks tension or an element of danger. As the central villain, Bobby Cannavale goes big with his performance, but otherwise isn’t given much to do. The action scenes are enjoyably ridiculous (sign us up for dance fighting lessons) and the use of video game rules to create some dramatic stakes is smart. Jumanji is unashamedly simple in its terrain. The main cast is engaging – Jack Black is a lot of fun, playing what amounts to an image-conscious teenager stuck in the body of an overweight adult. There’s an old school, back-to-basics feel about the film, with the onus on character rather than action. It may be modest in its goals, but the results are pretty entertaining. Welcome To The Jungle was shot at 3.4K resolution and mastered theatrically at 2K. The upscaled image features better defined colours and punchier skin tones. Certainly in the case of Johnson's Dr. Smolder Bravestone, his complexion has more presence to it. As you'd expect, the 4K HDR exerts tighter control over the brighter and darker aspects of the picture. It's more nuanced and colourful in its appearance, as well as having greater accuracy in the various tones and textures in a scene. Contrast gets a boost too. The clouds in the scene after their first encounter with Rhys Darby's Nigel have more definition to them than on the Blu-ray. 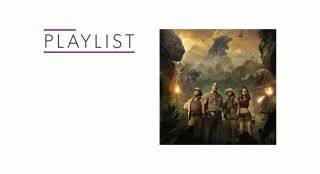 The luminescence of colours is more vividly conveyed, especially in the scene where the characters are sucked into Jumanji. Detail sees an improvement too, with more fine detail in the grease and dirt of characters' clothing. The 4K disc includes both HDR10 and Dolby Vision encodes. We can only attest to the HDR10, but it's a satisfying presentation nonetheless. Once we enter Jumanji, the sense of height and space in the track is immediately apparent. Detail levels are very good, with flapping bird wings and jungle sounds communicated with clarity in the surrounds and overheads. The expanded height Atmos affords is used in an inventive way. When characters respawn, the 'ping' sound of their re-entry is clearly communicated in the height channels. It's followed by a weighty thud as they land. Action scenes are alive with detail. Take the set-piece where the heroes have to rescue a jewel from a white rhinoceros. There's good use of low frequency effects in the stampeding thud, as well as able use of surrounds and Atmos to communicate the frantic nature of the sequence. Whether it's the rumbling drums of Jumanji or a missile flying past, the panning of effects are crystal clear to track. Henry Jackman's light adventure score is placed in the surrounds and height channels and adds to the track's sense of space. Dialogue is clearly rendered and for the most part, placed in the centre channel. The Atmos track really adds to this film's sense of fun, using the extra space and height to good effect. Welcome To The Jungle is up there with the better video game movies that aren't based on an actual computer game. Admittedly, in light of the lengthy list of poor video or boardgame adaptations, that’s the faintest of praise. But thanks to its charm and engaging tone, this film ends up a winner. The 4K HDR disc is a satisfying effort, with a picture that's a fair boost over the Blu-ray, and an immersive and exciting Atmos track too. If you enjoy the film, the UHD presentation will only enhance your experience.